Join Ryan Engelstad, licensed therapist and writer, as he explores ways to normalize the struggles with mental health. Topics range from mental health and behavior change to parenting to the best apps for mental health support. Follow along or leave messages if you'd like to join the conversation! I had a great conversation with Tristan Miller, award winning actor and writer/comedian. We talked about his struggles with Bipolar Disorder and how he has channeled his experiences into his new one man show called Manic Impressive. In this episode I talk to Ram Reyes, half of the duo from the Boyz Do Cry podcast. Ram talks about dealing with mental health issues in today's social media influenced world and how that makes things both easier and harder sometimes. Check out boyzdocry.com for more info. In this episode I talk with author/professor Dr. Bill Ferraiolo, author of Meditations on Self Discipline and Failure: Stoic Exercise for Mental Fitness (available on Amazon). We go into his personal struggles with mental health and how stoicism has helped him and can help other build a framework of focusing on what they can control. In this episode I talk with Stephanie Taylor, author of Animals That Heal, about the differences between emotional support animals and psychiatric service animals, and the benefits they can offer people struggling with mental health issues. In this solo episode of The Best Medicine, I talk about one activity that has been part of my Best Medicine over the years. I also give a review on the mental health AI app Wysa. If you like this episode please subscribe or rate us 5 stars! We are planning on doing an upcoming listener questions episode so send all questions you want answered to @engelsry on Twitter or leave a voice message on the Anchor app. On this episode I talk with Brooklyn based therapist Justin Lioi about working with men in therapy and what gets in the way for them. We touch on the language that men avoid in seeking help versus language they are comfortable with, cultural issues, stigma, and what being in therapy can do for men in their relationships. In this episode I talk with Mike Graham, host of the Game Socket show and podcast, about his experience with Bipolar 2 and the decisions he has made to help himself cope. We had a great conversation about the importance of validation in therapy and finding support. Please like and subscribe! In this episode I talk to Richard Kaufman, host of the Mind Body and Soul podcast. Richard and I talk about his journey through the rooms of AA and learning to accept the help and support of those around him to build sobriety. In this episode I talk with an anonymous guest about supporting loved ones going through mental health struggles. We talk about how to practice self care while also caring for the needs of loved ones. If you'd like to come on as an anonymous guest please reach out to me @engelsry or leave me a voice message on the Anchor app. Enjoy! In this episode I talk with Tam Spires of the Tam's World podcast about the why's and how's of keeping things light in recovery . Tam was generous enough to share some of her recovery process and the lessons she has learned along the way. In this episode I talk with Mia Andrea of the Visdom from the heart podcast about emotional honesty and opening up inside or outside of therapy. In this brief episode I talk about the recent suicides in the news and why making conversations about mental health normal is more important than ever. Episode 3-A conversation with J. Sparks about motivation and behavior change. In this episode I talk with J. Sparks of the Ignite the Sparxkx podcast. We go deep on motivation and changing problematic behaviors. Enjoy! Today I talk to Asiyah from the Asiyah Thinking podcast about coping skills and how what we think helps us feel better often hurts us in the long run. Enjoy! 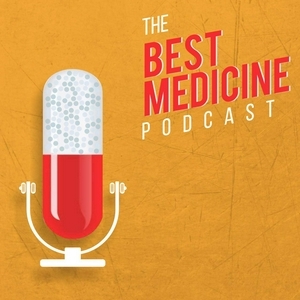 The very first episode of The Best Medicine Podcast. In this episode I talk with Coach Marc White about anxiety, PTSD, and some strategies that can help. Feel free to leave me a message and I may respond to it next week, here or on Twitter @engelsry. Enjoy!